English Cottage Lifestyle, Issue #011 -- <> Clotted Cream and Devon. Photo: Gardeners cottage on Agatha Cristies Greenway Estate on the river Dart, Devon. Recipe Of The Month: "Devonshire Cream Tea"
Spring is the perfect month to have a spring clean and get your cottage and garden ready for the summer months ahead. It’s a busy month for the gardener, frantically pruning and cutting off the old to make way for the new and if you have a vegetable patch this is the month to begin most of your planting for the year. With all this work cooking may be the last thing on your mind so why not try a simple recipe that can be made in about 20 to 30 minutes and tastes absolutely divine! Scones can be made in just a few minutes and when lavished with clotted cream and strawberry jam you may think that summers here already. It is the signature dish of Devon and a farmhouse and cottage staple. Devonshire cream tea is a regional dish of Devonshire and the West Country mainly Devon, Cornwall and Somerset. It is a simple recipe that could be made quickly when the labours came off the fields to the farmhouse. The farmers wife would of also had a long day and they all would be hungry so something quick, filling and tasty was needed. A cream tea does the job just perfectly. A Devonshire cream tea is a scone split into two, lavishly spread with about an inch of clotted cream and then each half would have a teaspoon of strawberry jam. In Cornwall its done a little differently; the scone is split in half and then butter is sometimes added followed by strawberry jam and then a small amount of clotted cream on top. They used to use a “Cornish Split” which is a sweet white bread roll, not a scone. The origin of the cream tea is unknown but historians discovered that the tradition already existed at Tavistock Abbey in Devon in the 11th century. The scone has a few simple ingredients eggs, milk, butter, flour and baking powder (or self raising flour). It is neither cake or biscuit but something in between. It is always served after cooling for a few minutes fresh from the oven and it is never toasted. 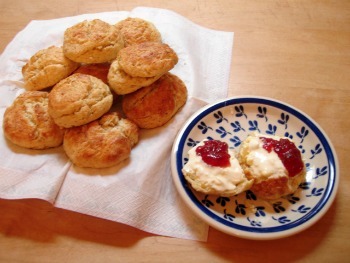 As this dish is from the West country a scone is pronounced scone as in ‘gone’. The recipe is below. There can be some variations; cheese scones served with butter not cream and fruit scones made with sultanas served hot with butter. Again never toast a scone as it will change the texture. Clotted cream is a special cream from the West Country, particularly in Devon, the gentle climate and fertile soil where local cows graze makes a special type of creamy milk. Simply put; you need milk before it is pasteurised and it needs to stand for several hours. The cream will rise to the top. Then you skim the cream and put into big pans. The pans are then floated in constantly boiling water; a process called ‘scalding’. The cream will become thick and forms a crust like butter on the top. It will be the consistency of soft butter. Today the cream is extracted by a separator as it leaves the dairy and goes to the place where it is produced, while leaving enough cream for the rest of the product so that is still can be classified as milk. If you want to make it at home you will need 2 pints (1.2 litres) unpasteurised cream cooked in a heavy sauté pan on the stove at a low setting for 5-6 hours do not let it boil or simmer; keep the temperature below 88 degrees C/190 degrees F. An oven with a temperature as slow as 50 degrees C/110 degrees F will work too. It will have a yellow crust when it is ready. Leave to cool overnight, a pantry works better than a fridge. The next day remove the crust and put the cream into sterilised jars and store in the fridge. The clotted cream will rise to the top and the rest will be a rich double cream great for cooking. Eat within 7 to 10 days. Strawberry jam is always used. It is not a Devonshire cream tea with any other flavour. Home made strawberry jam is the best with this English classic. Devonshire cream tea should always be served with a cup of tea. Normally a black tea with a spot of milk and no sugar. The cream tea is sweet enough. China tea wear is preferred but that is a personal choice, Devonshire cream teas are so yummy they can be served on a napkin and taste just divine. Traditionally afternoon tea is served at 4 pm about the time when the workers would have been coming back from the fields to the farmhouse. It’s also the time when the wealthy would have been getting peckish after lunch but before dinner. A Devonshire cream tea is perfect at this time. The warm weather is here and it’s time to venture out into the garden again. This March has been mild and in Devon the spring flowers are blooming and a joy to see after winter. It’s time to begin preparing the soil and planting for the year ahead. Devon is cottage heaven the home of Cob cottages and Cob building. This county has it all for the cottage lover; granite cottages on Dartmoor, stone cottages by the sea, even oak is present on some cottages. 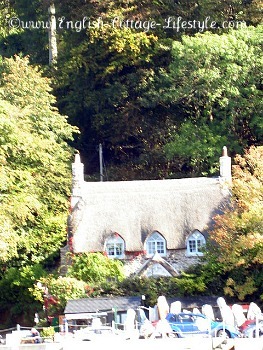 Chocolate box thatched cottages adorn the landscape from the coast to countryside. This is one of the UK’s favourite holiday destinations with the coast on both sides and glorious countryside in between makes it a great place to enjoy England at her rural best. A trip to Devon will help you relax and unwind with it’s slower pace of life and good living. Devon has something for everyone, fantastic local produce, wine, cider and beer. Steam trains and surfing, England’s last wilderness on Dartmoor, tales of Pirates and Smugglers and home to England’s finest Seafaring men. This is a horse and dog friendly county with all manner of walks on trails, paths, bridleways, and National Parks and you are never too far from a village pub for a spot of lunch, local brew or a Devonshire cream tea. 1lb (450g) Plain (organic if you have it) flour. Reserve ½ an egg from the eggs above. Reserve 3 Teaspoons of the milk above. Whisk together. 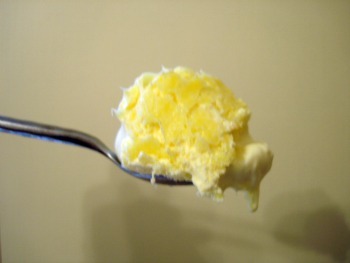 Clotted cream. If you cannot get clotted cream use whipped cream. Strawberry jam. Optional: Pot of black tea with a splash of milk and no sugar. 1) Pre heat oven to 475 degrees F/250 degrees C/gas mark 9. If your using an aga place the rack on the 3rd level in the roasting oven. 2)Sieve the flour into a large mixing bowl. Add the salt, sugar and baking powder into the bowl with the flour and mix it up with your fingers, adding air into the flour mix. 3)Cut up the butter into cubes and rub into the flour with your fingers until it flakes. 4)Add the eggs and milk (reserving what you need for the egg wash above) With one hand mix the ingredients in a circular motion, nice and quick it should be ready in a few seconds, do not over work the dough. 5)Flour your work surface and begin rolling out the dough to about 2.5 to 3 cm’s thick, about an inch. Then cut out the scones to size. You have enough dough for 10 large scones or about 15 to 20 smaller ones. I made 10 large…See photo below. 6)Place on baking tray (I used a ‘Sill Mat’ to prevent sticking) and bake for approximately 10 to 15 minutes or until golden brown. Watch over them as you don’t want the to over cook. 7)When ready remove from oven and let cool on a cooling rack for a few minutes. 8) When ready slice horizontally and spread a generous layer of clotted cream (to taste) and then add the strawberry jam (to taste) and enjoy with a cup of black tea served with a spot of milk, no sugar is normally needed.